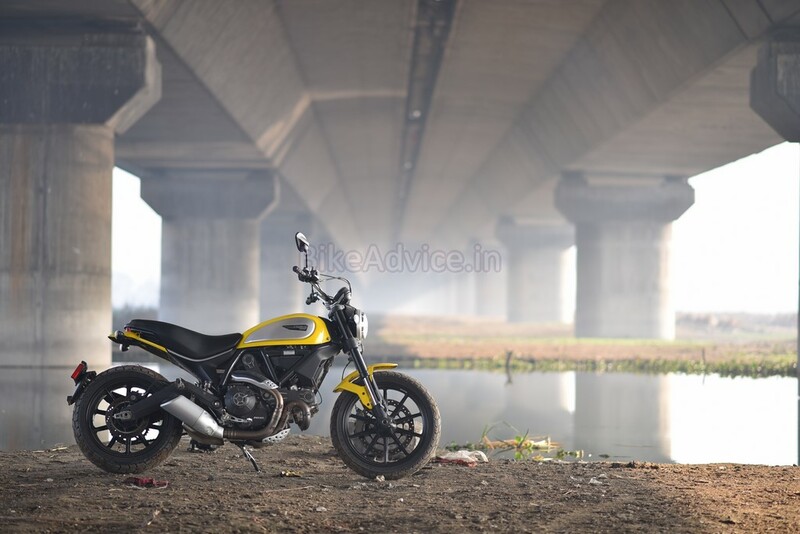 Between finding gaps in traffic and darting through them on the yellow Ducati Scrambler, a deep, familiar, burble caused me to momentarily look in the direction of its source. 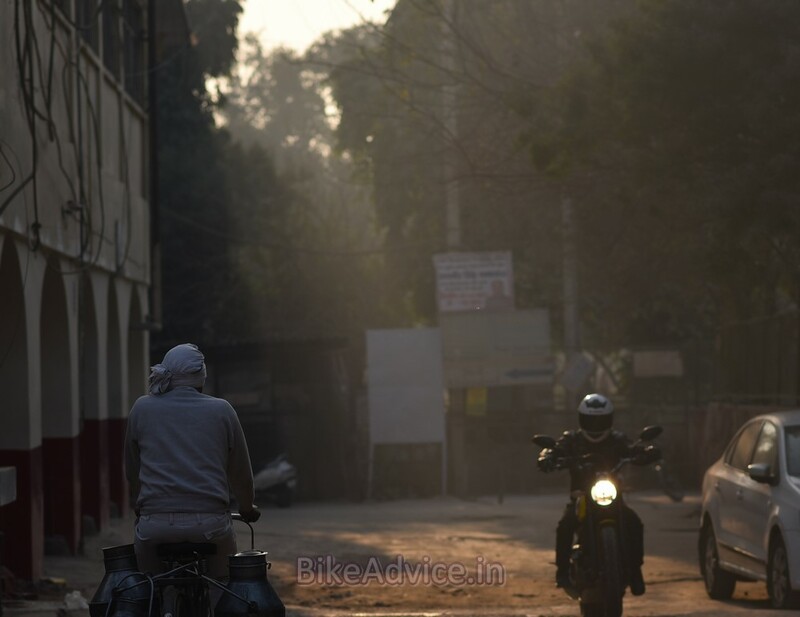 I could spot a fat rear tyre… of a big bike… And then, a slight rearrangement of traffic brought it within an easier line of sight. It was a black Speed Triple being ridden quite sanely, and I immediately wanted to give him a thumbs-up — for his choice in bikes, and also for not being a jerk in traffic — but I didn’t. The admiration and respect went off the wastegate seeing him wearing his sister’s half-face helmet, sneakers, and no gloves. That also got me thinking about the types of Johns who buy litre-class (and above) rocketships in India. There are two, primarily. One would fall under the ‘real biker’ category and you see them swathing their social networking profiles with pictures of them riding with their ‘bros’ to the nearest pub mostly, with occasional track days thrown in between. 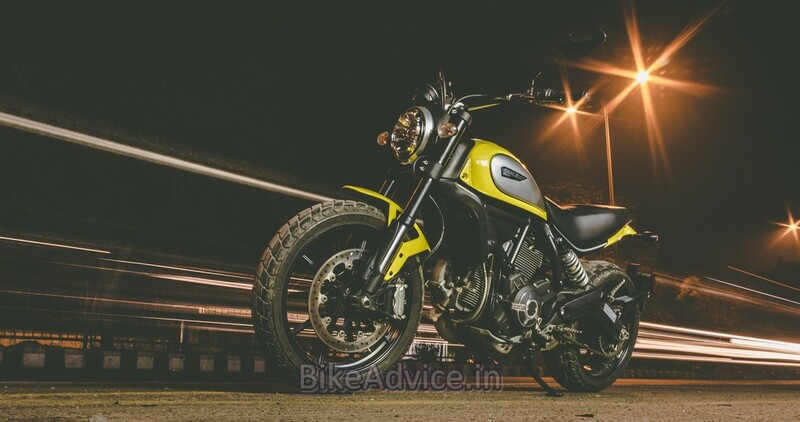 The other type would be that rich kid who bought the superbike from daddy’s money (of course) only to zip around the poshest hangout around his locality to garner the attention of femme fatales… If you fit even slightly in either of these categories, you may close the browser right away as the Ducati Scrambler is not for you. 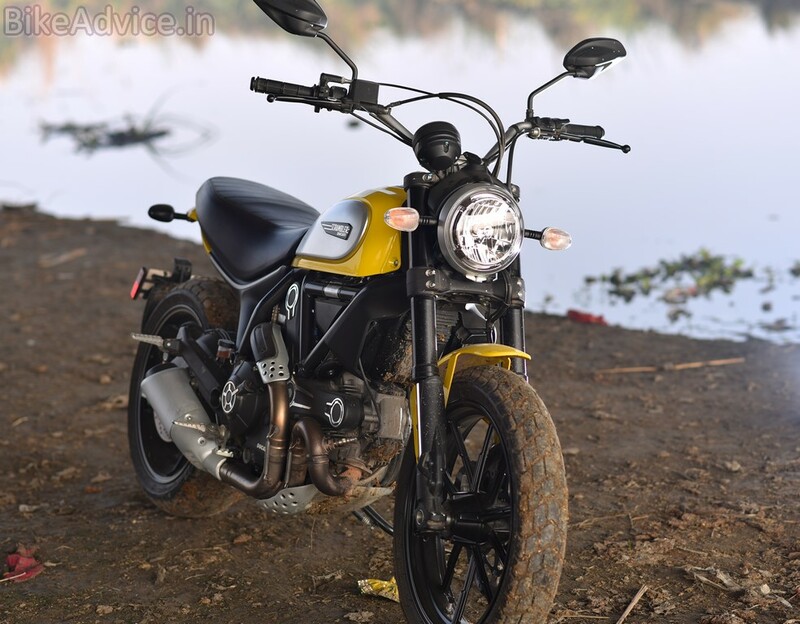 This motorcycle will neither give you horsepower bragging rights, nor will it sound like Armageddon when you blip the throttle outside an all-girls college. …a distinct identity to begin with, but not at the cost of uncomfortably making you the cynosure of everyone around. This Ducati has got oodles of style but it’s not screaming for attention — that’s perfect in my book. 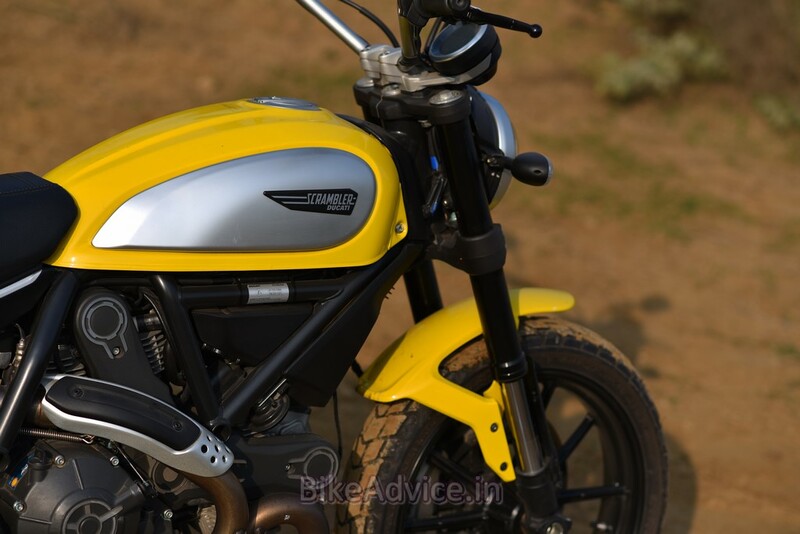 And the minimalist styling not only befits the Scrambler name but also looks so simplistically beautiful that you actually begin to look at its namesake from Britain with contempt. 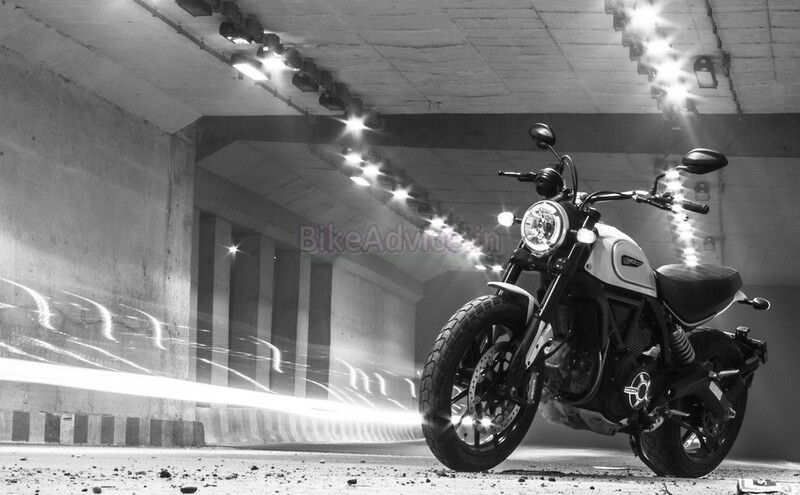 Don’t get me wrong here — the Bonnie is a beautiful bike; it’s the scrambler version that’s just not easy on the eye. It is obese and those high silencers do look like an afterthought. Before you scream ‘sacrilege!’ let me tell you that modifying road bikes for specific use was acceptable in the sixties and seventies, not now, especially if you are a mainstream manufacturer and not a custom shop with limited resources. So, full marks to Ducati for getting it so damn right! 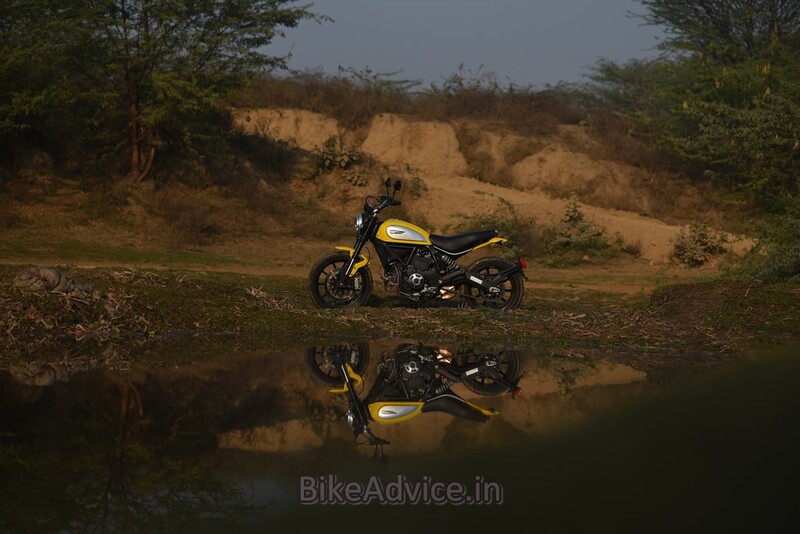 And in this bright shade of yellow, this motorcycle would bring a smile to even the most dispassionate souls. 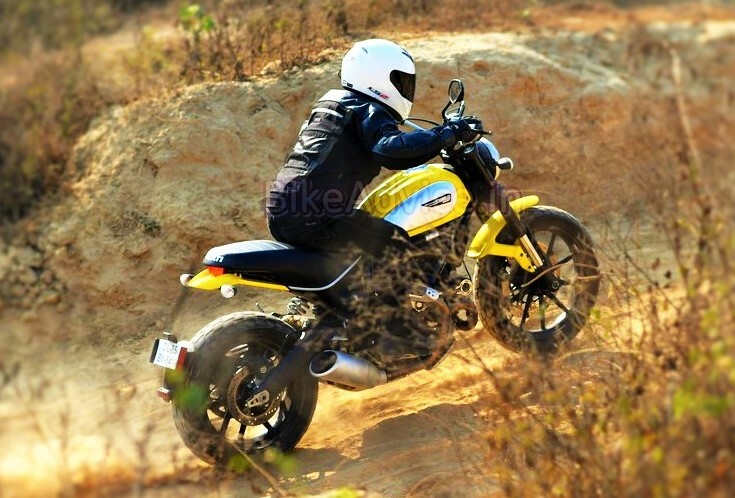 The Scrambler will remind folks, who perhaps rode or saw one in the ’70s, of the Ducati 450 R/T Desmo. 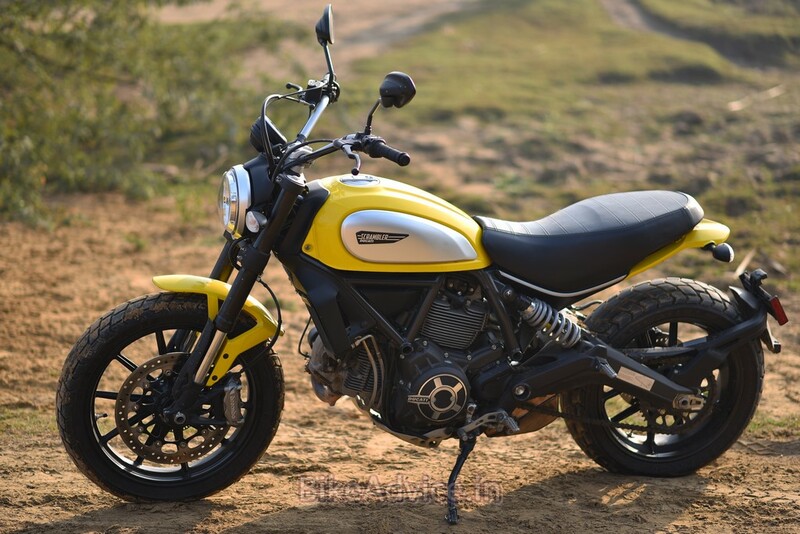 Also, while almost all big bikes look intimidating, especially to shorter riders (like yours truly), the Ducati Scrambler is quite the opposite. In fact, this has to be the most inviting 800 cc (well, 803 cc to be precise) motorcycle on sale in country today. The 790 mm seat height is low enough to make the shortest of us riders touch down on both sides, and an even lower (770 mm) accessory seat is available if God has really been unkind to you in the inseam department. And it’s not that taller riders would be uncomfortable. Himanshu, at 5’11, found the ergos to be just right for him. The handlebar was too upright for me though, but one of the many allen keys provided in the tool box can be used to lower it for a more comfortable position. However, by doing so, the brake and throttle wires cover that beautiful single-pod instrument cluster a bit, which is okay as you would be having too much fun to look down on it anyway. The front brake lever is adjustable for span, but the clutch lever isn’t (the Bonnie’s is). The fit and finish of all switches, panels, and parts is impeccable and the company has not cut any corners in what is the cheapest Ducati in the lineup. And even then it’s a catch-22 situation. Let me explain why. The problem is, if you switch all the electronics on you would be riding a motorcycle that feels just too normal and civil. That’s not what you paid 15 to 25 lakhs for, right? Switch them off and you immediately realize that you’re either a sissy or you just lack the superhuman skill to master and enjoy the full 200 horses at your disposal. I don’t know about you but I don’t want my motorcycle dash flashing up “I Might Kill You Today” script every time I switch the traction control off and set the power mode to F. Of course, they don’t come with that feature as yet, but you do get the feeling, and it’s not completely unfounded. No such drama with this Ducati though. Because you’re in control right from the word go — even when the front wheel comes up ever so slightly in the first two gears or when the rear slides out while powering out of a corner… Seventy-five horses (at 8,250 rpm) might not sound much to you but a dry weight of 170 kg means that this Ducati might just be the lightest 800 cc motorcycle in the world today (for perspective sakes, the 675 cc Street Triple weighs 168 kg dry). 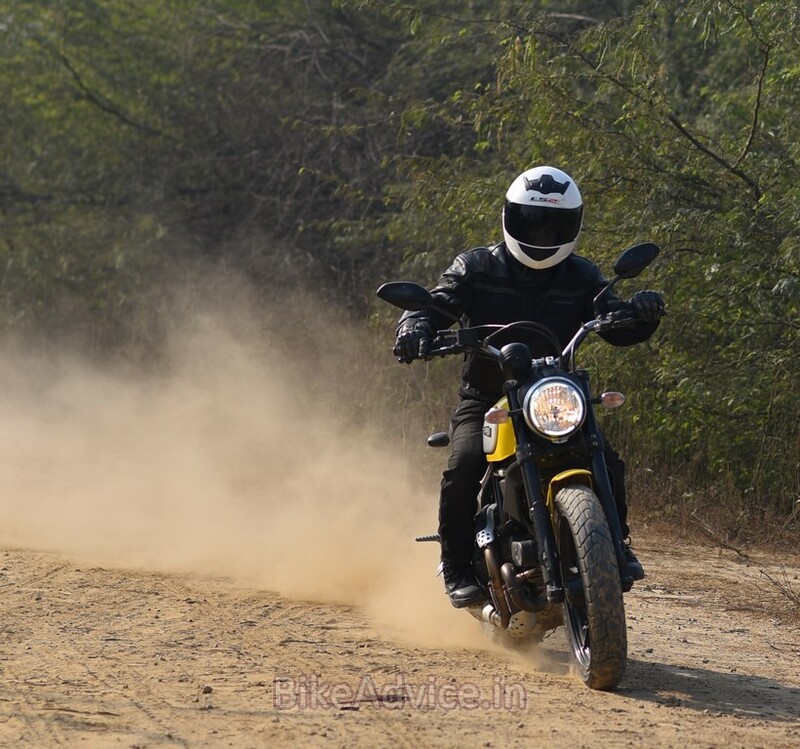 That means it has a much better power-to-weight ratio than the 59 bhp / 214 kg dry Triumph Bonneville Scrambler (not available in India yet). And it shows. The way the Ducati shoots off the line can take you by surprise! A pleasant surprise at that. It’s not threateningly quick, but the alacrity will keep you grinning constantly like a kid upto some mischief. But there’s a pitfall to all that eagerness. Well, it’s not a major concern really, but the fuelling is abrupt at low revs, which, coupled with a relatively heavy-pull clutch, might make rush hour commute a bit taxing for newer riders. The Bonnie is better here, and its cause is further helped by the fact that its 68 Nm of torque (same as the Ducati’s) comes in a thousand revs earlier than the Italian’s 5,750 rpm. But, the experienced folks won’t mind it that much, and there are slim chances anyway of you crawling along with traffic on this Ducati… I say that because it’s a, er, slim bike, save for the wide handlebar and mirrors, and you can make your way through the kind of gaps most riders would either be oblivious to, or their steed might simply not have the combination of feline agility and instantaneous burst of power (which the Scrambler has in abundance) to make it through such gaps before that cabby makes a moronic move. 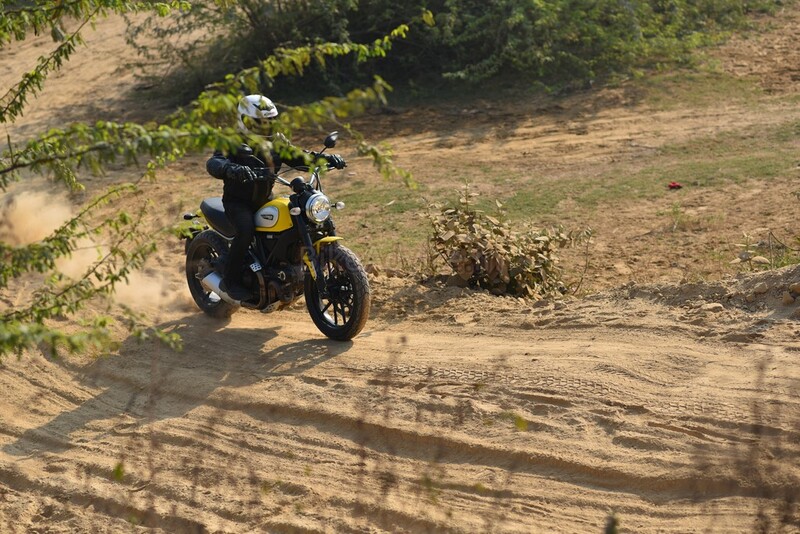 And when eventually the cagers end up occupying the last square inch of tarmac, you won’t hesitate for a second in taking the Scrambler off the road and blast off into the distance, involuntarily flying a pebble or two at the undisciplined (and inconsiderate) drivers. 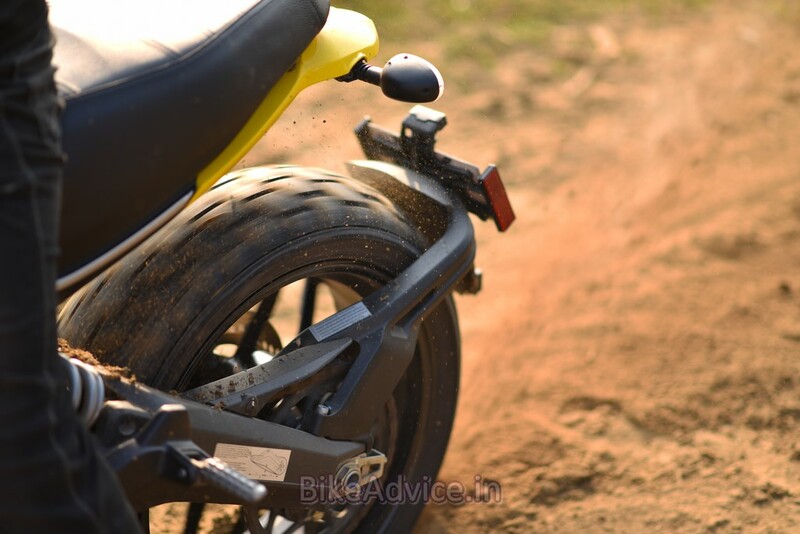 Those Pirelli MT RS tyres are fantastic for light off-roading without compromising the on-road grip. 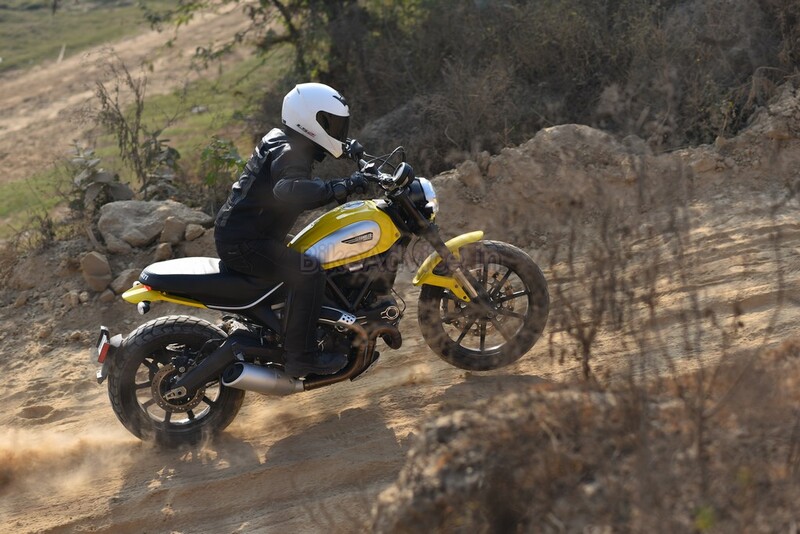 Moreover, while the Scrambler’s taut chassis and suspension make it a hoot to ride in the twisties, its straight-line stability is quite remarkable too. The bike remains superbly planted at all speeds and despite the diminutive size it’s not at all affected by crosswinds either. In fact, here I can make a confession as well. I look back and notice that whenever I got a litre-class bike to test in the recent past, I could get close to the 200 km/h mark by only around the second or the third day of testing. The first one or two days are somehow spent like your first date with a supermodel where you are at your best behaviour, treading ever so cautiously so as to not do something that offends her… On the other hand, the Scrambler is that kind of a woman whom you click with instantly (a rarity nowadays), and it’s a fairy tale thereon. Might not ever happen with two humans in the picture, but it’s still possible with a motorcycle… For the record, she did make me comfortable enough to take her to 190 km/h within our first 15 minutes of acquaintance! The suspension, as I mentioned earlier, is on the firmer side but I reckon heavier riders would find it more compliant. The USD forks are non-adjustable while the monoshock can only be adjusted for preload, which I wrenched to its softest since I fit in the featherweight class of riders. And then I did not slow down at all on the bad patches; I just stood up on the pegs and enjoyed beating the crap out of all those bumps and humps! Oh, and this ‘entry-level Ducati’ comes with top-shelf brakes! 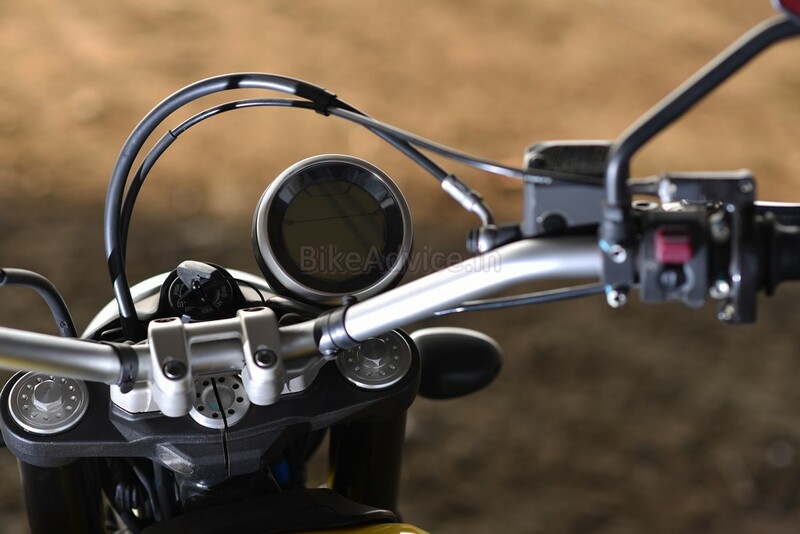 The Scrambler gets a humongous, 330 mm, brake disc at the front pinched by Brembo’s radial-mount four-piston monobloc calliper, and a 245 mm unit (for perspective, Z800 comes with a 216 mm rear disc) at the rear with a single-piston floating caliper. 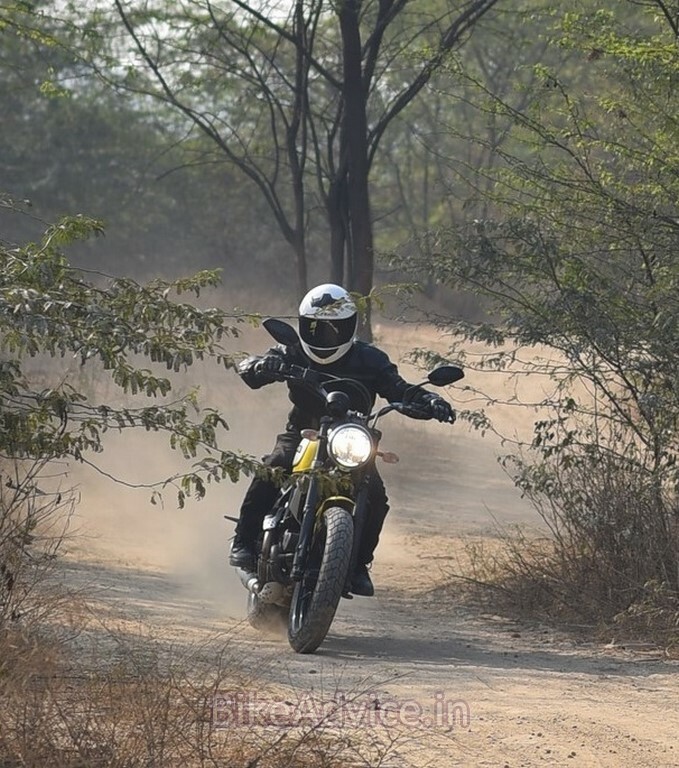 Not only is the bite ferocious, the feel at the lever is better than even some bikes’ costing a couple of lakhs more than the Scrambler! ABS is standard; it can be switched off, but you won’t have to because it is simply one of the least intrusive systems you’d ever experience. 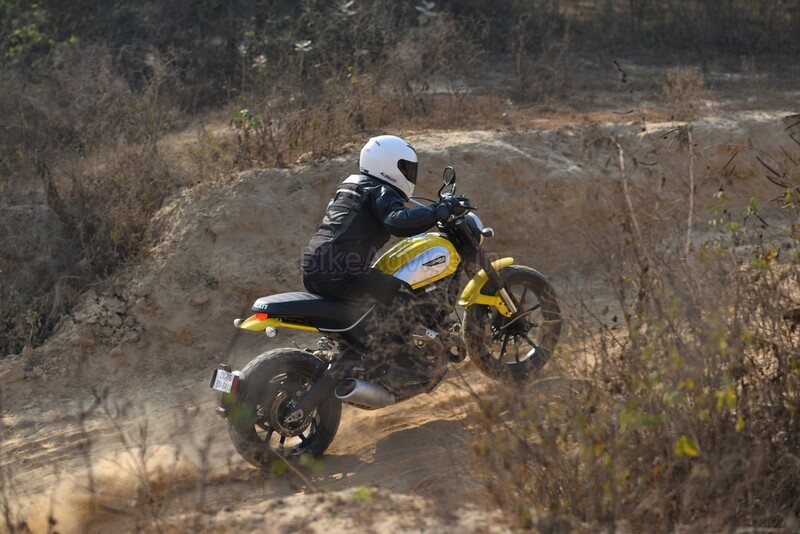 And while doing all of the above, the Scrambler returned an impressive 17.77 km/l. Expect around 18-20 km/l in city with a saner hand, and I feel the figure may rise upto around 23-25 km/l on empty highways. The tank capacity is 13.5 litres, so you do the math. 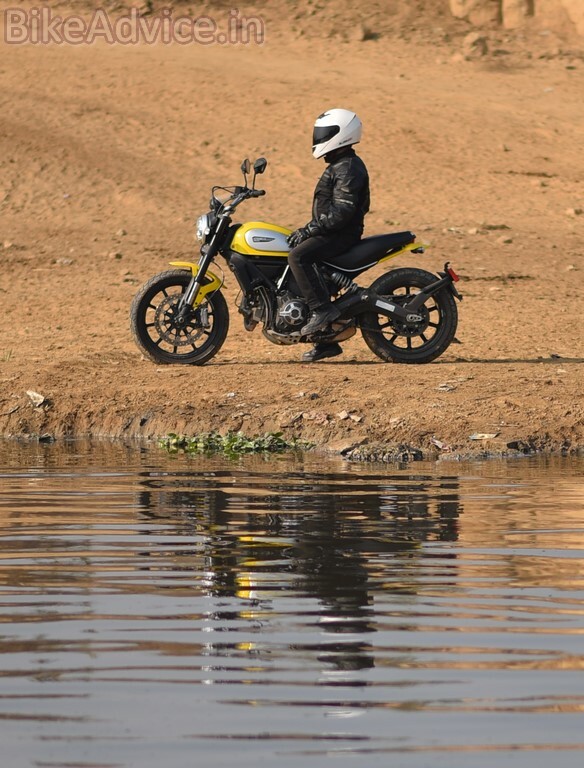 But, price, and displacement battles aside, the most significant fact of them all is that Ducati, with the Scrambler, has put that all important ingredient called “FUN” back into motorcycling! This bike is so much fun everywhere — be it off the road or on it — that it could have been named Funstrada and still gotten away with it.